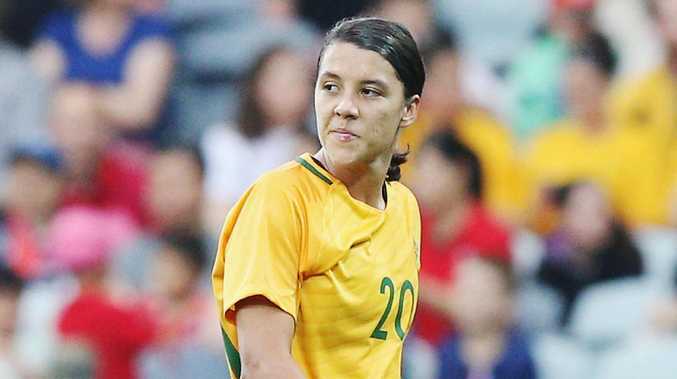 AUSTRALIAN footballers Sam Kerr and Riley McGree have been controversially leapfrogged at the FIFA awards night in London, sparking heated backlash from incredulous fans around the world. . The Matildas, who won a sensational four games in a row over footballing heavyweights, soared to their highest ever ranking by the end of 2017. Aussie striker Kerr strong-armed her way into the top 10 and was deemed a shoe-in by fans. Surprisingly, the Fremantle-born superstar placed ninth despite being widely tipped to become one of the nation's greatest ever international exports. Unsurprisingly, Aussie fans were absolutely livid at the result, which saw Brazilian star Marta Vieira da Silva claim the accolade for a record sixth time. Marta claimed 14.73 per cent of the awards in front of Hungarian midfielder Maroszán Dzsenifer (12.86 per cent) and powerful Norwegian striker Hegerberg Ada (12.60 per cent). The voting system includes three votes from team captains to dish out to the most impressive players of the year. In a stunning show of respect, Kerr was one of Marta's three picks. A vote from one of the greatest stars to ever lace up a boot clearly wasn't enough for Kerr to become the first Aussie footballer to place on the podium of the year's best. The 25-year-old claimed just 6.78 per cent of the votes after leading the Matildas' stunning charge to the Asian Cup final last, scoring an incredible 11 goals in 14 games for Australia in the calendar year. Egyptian forward Mohamed Salah claimed the Goal of the Year accolade at the FIFA Awards night, trumping Gareth Bale's unbelievable overhead kick and McGree's A-League scorpion stunner over the summer. Bale's goal, which shocked the footballing world, is widely regarded as one of the best strikes the Champions League has ever seen. But Liverpool's Salah, who was also in the running for Player of the Year, claimed victory with his incredible one-man effort against Everton which saw him skittle two defenders before sinking a curler into the top left pocket. The goal gained 38 per cent of the more than 500,000 votes cast, but the perception remains had McGree's unique goal been scored in Europe in a more high-profile league it would have been a different outcome. Fans were also scratching their chins at the decision to grant Belgian goalie Thibaut Courtois the Goalkeeper of the Year award despite not being named in the World XI.